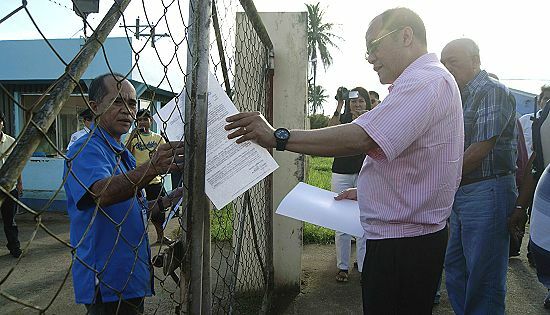 ORMOC CITY – The city government of Ormoc has finally fed up when the mayor personally handed the cease and desist order to the LIDE Management Corporation yesterday, past 4 in the afternoon, February 28 at their water pumping station in Brgy. Salvacion, this city. Ormoc City Mayor Eric C. Codilla together with his Vice-mayor Nepomuceno P. Aparis I and some members of the 12th Sangguniang Panlungsod handed over and read the order. The Leyte Industrial and Development State-LIDE Management Corporation supplies water to PhilPhos-Philippine Phosphate Fertilizer Corp and PASAR-Philippine Associated Smelting & Refining Corp located in Isabel Leyte. It also supplies to Merida and Isabel towns and 8 villages in Ormoc. LMC’s water source is located in the villages of Sto. Niño and Salvacion of Ormoc City with 8 pumping machines with an average of 20,000 cubic meters of water extracted daily. The cease and desist order was addressed to Eddie G. Agustin the General Manager of LMC. Mayor Codilla directed the LMC to immediately and completely cease and desist from doing, performing, or continuing, in whole or in part any of the following acts: (1) extracting of water from all sub-surface sources within and forming part of the city of Ormoc and its barangays, specifically Brgy Sto. Niño and Brgy. Salvacion; (2) the operation of water pumps and related machinery utilized in water extraction from all sub-surface sources within and forming part of Ormoc and its barangays; (3) the operation of any and all machineries and implements used or devoted, whether partly or wholly, to raise, pump, transfer, transmit, compress, or by any other similar means deliver water extracted from all sub-surface sources within and forming part of the city of Ormoc and its barangays; (4) all other such acts analogous and complementary to the foregoing acts. The order was due to the continued failure and refusal of LMC to comply, despite lawful and final notice and demand with clear and mandatory provisions of city ordinance number 49 entitled “An ordinance imposing regulatory fee on the extraction of water for sustainability and requiring the concerned establishment to set up environmental guarantee fund” specifically section IV, subsection 1, paragraphs B, C and E and section IV, subsection 2 and 3. The order is lawfully issued and enforced pursuant to the powers granted and duties imposed upon the mayor in Republic Act no. 7160. LMC was given 24 hours to voluntarily and comply and submit formal written and verifiable evidence and undertaking of such compliance. The city government of Ormoc has been asking their tax amounting to 80,000,000 pesos in 4 four years. There were apprehensions of the city government that because of this water extraction might cause soil subsidence, salt water intrusion and sinkhole that happened in other places. Mayor Codilla said that these catastrophe possibilities could happen because of the climate change and he does not want to be blamed. So he must act now, he said. Mayor Codilla said what he did is not to give discomfort but to protect the environment. There is already an ordinance and it need to be implemented though it risks my personality but it has to be done for the benefit of the Ormocanons. LMC area operation in-charge Mardenio T. Tapang received the order while Nilo Comaling said that they already shutdown their pumps at 3PM before Mayor Codilla arrived and handed the order. LMC manager Agustin is in Manila and was not able to get his comment. It was learned that he city government and LMC had been talking about the issue since 2008. CALBAYOG CITY – A 29 seater aircraft is set to serve the city to the other parts of Visayas region realizing the dream and interest of common travelers. In a short press conference held recently at Ciriaco Hotel and Resort, Philippine Ambassador to Papua New Guinea Bienvenido V. Tejano said that the island of Samar should be given a chance to equate with other provinces in the Philippines. He revealed that the province is undeniably one of the most underprivileged areas in the country compared to others. In order to change the impression, the transport sector should be improved and new investment should be introduced, he said. He took the challenge by encouraging local businessmen to put up investments in air transport that would cater domestic flights in the region and making Cebu as the commercial hub instead of Manila. “We are not here really to make money because it is very elusive at this point in time. This is just the beginning of the project and I know we’re going to handle a lot more challenges,” said Tejano. Aware of the “big time” airline competitors, he’s assured that ETA Airways would survive by bringing and promoting the region’s own resources to domestic and foreign tourists. Recognizing the progress of Calbayog, Eagle Trans Asia Airways (ETA), Corporation has set up an office here servicing flights for Calbayog to Cebu and Tacloban City with an approximate time of 25 and 15 minutes, respectively. Its first flight will kick off on March 5. Target market will be the government agencies, corporations, cargo consolidators, freight forwarders, travel agencies, wholesale tour operators, students studying in Cebu or those who will be attending conferences and seminars. Furthermore, Ambassador Tejano announced that he is pushing for the establishment of a flying school either in Catarman, Northern Samar or in Calbayog City. Its purpose is to unfasten the doors for younger generations to study aeronautics in a flying school strategically located in Samar, and fulfilling the high demand of Filipino pilots competing globally, clarified Tejano. QUEZON CITY – The Trade Union Congress of the Philippines (TUCP) yesterday welcomed the introduction of e-jeepneys and its monthly salarization scheme to its drivers as a possible introduction of a paradigm shift to alleviate the plight of thousands of Filipino drivers and reduce emission of fossil-fuel pollution. “The introduction of regular monthly salary to e-jeepney drivers could probably change the daily calculus of our drivers in terms of income and working environment. Nowadays, with the boundary system, they are earning a measly 300 to 400 pesos take home pay after a day’s 10-hour rigorous work. Yet, if they are paid with e-jeepneys’ regular salary, well, this can spell an improvement in their way of life,” said Democrito Mendoza, TUCP President. Mendoza also emphasized that with the current e-jeepney concept as introduced, drivers will not just enjoy the security of a dignified waged earner but they will also contribute in minimizing the pollution in their working environment. “With the e-jeepney, drivers’ exposure and their contribution to the pollution on the streets where they work is dramatically lessened. If pollution in their working environment is minimized, they tend to be more productive,” Mendoza added. Mendoza made the reaction in view of the granting of Land Transportation Franchising and Regulatory Board (LTFRB) franchise the other day to 21 e-jeepneys to ply some select routes in Makati City beginning tomorrow March 1. There are 203,000 estimated registered fossil-fuelled jeepneys with the Land Transportation Office (LTO), and around 50,000 of which are in Metro Manila. MANILA – The militant women's group Gabriela scored the magazine FHM Philippines not only for the March issue cover design's racist undertones but more so for the magazine's routinely sexist and anti-women portrayal of Filipinas. Gabriela secretary general Lana Linaban said that the March issue displaying Bella Padilla’s body among dark-skinned models was indeed feeding into colonial concepts of fair-skinned women as superior while dark-skinned figures are mere “shadows”. This, on top of its usual portrayal of women as cheap commodities that cater to macho fantasies, shows FHM at its worst in discriminating against women. "We women's rights advocates condemn the publisher Summit Media and its editors for continually distorting women’s bodies and packaging them as so-called modern women. But the truth is, they (ab)use women as commodities and conduits of mindless purchase of products and services that further enslave men and women in pursuit of hedonic consumption, blinding society from seeing the harsh economic crisis," Linaban said. GABRIELA promised to be relentless in its effort to address issues concerning discrimination and abuse of women. Commodification and other form of violence against women arising from heightened poverty will be part of issues that will be highlighted on women’s action on March 8 – International Women’s Day. TACLOBAN CITY – The PAG-IBIG, Inc Regional Office 8 is offering penalty condonation and loan restructuring programs for their delinquent borrowers as mandated in their Agency Circular No. 299. 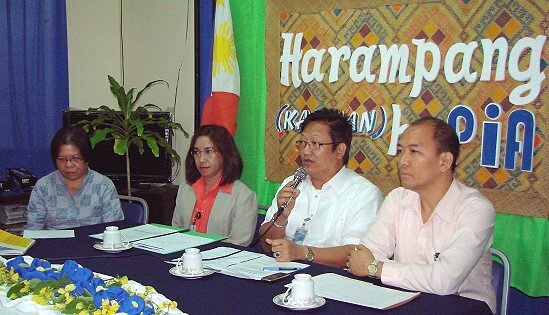 This was formally announced in the regular “Harampang-Kapihan” on February 23 in the regional office of Philippine Information Agency (PIA-8) Tacloban City, Leyte. As lamented by Engr. Paul Talacay, Regional Manager of PAG-IBIG 8, said programs seeks to protect the interest of the members through practicable means to settle their membership contribution arrears. In response, the agency is providing assistance to the members who are in arrears of at least three (3) months. Talacay also emphasized, the objectives, among others, are to provide assistance to the delinquent borrowers for the preservation of their properties from foreclosure. Penalty condonation will run until June 30, beyond that members may still avail the loan restructuring program. For those who may be interested to avail the programs, they may inquire at the PAG-IBIG Regional Office 8 for the corresponding documentary and procedural requirements. Meanwhile, Talacay also informed the Group Housing Loan Program (GHLP) is now at place for the constituents and employees of local government units (LGUs) to have access to affordable housing plan. This aims to sustain the capabilities of LGUs to fast track the development and implementation of housing projects in their respective localities. Qualified applicant comprises of at least 30 members may avail the GHLP of PAG-IBIG. TACLOBAN CITY – All six provinces of Eastern Visayas have been identified as among the 31 provinces chosen as priority recipients of the AKBay program which provides funds for the poorest households in the farming and fishing communities. DA-8 Regional Executive Director Antonio Gerundio informed that the Department of Agriculture (DA), through the National Agricultural and Fishery Council (NAFC), is providing funds for the poorest households in the farming and fishing communities in 31 priority provinces in the country through the AKBay Program. RED Gerundio said that AKBay stands for “Agrikultura: Kaagapay ng Bayang Pinoy,” a poverty-reduction program funded by the Japanese Government, under the Japan Grant Assistance for the Food Security Project. The program is primarily intended for marginalized households that are engaged in farming, fishing and related livelihood based on the data provided by the provincial planning and development office. Recently, three Eastern Visayas provinces, namely Biliran, Samar and Eastern Samar, have each received the first tranche of AKBay financial assistance amounting to P2.09 million at P10,000 per household-recipient. The turnover of checks proceeded with a simple ceremony graced by representatives from the DA-8, Provincial Government through the Office of the Provincial Agriculturist (OPA), and the Regional, Provincial, and Municipal Agriculture and Fishery Councils (R/P/MAFCs). Mr. Benedict E. Montera, DA-8’s AKBay Program and RAFC Coordinator said that the turnover of the second half of fund assistance amounting to P2.310 million will soon be released to complete the P4.4 million allocations for each province-recipient, with additional budget for administrative expenditures. In the meantime, DA is still processing the AKBay funds slated for Northern Samar, Southern Leyte and Leyte, Mr. Montera said. DA-8 Information Chief, Francis Rosaroso said that the province-recipients were identified in the government’s Accelerated Hunger Mitigation Program and in the 2006 Family Income and Expenditure Survey as having the most number of subsistence poor or food-poor families. Only the 4th, 5th and 6th class municipalities in the priority provinces are covered by the program, Mr. Rosaroso said. On the other hand, the household-beneficiaries are pre-identified in the priority provinces through the Office of the Municipal Agriculturist (OMA) and the MAFC based on available credible OMA records. It is guided by the results of the Department of Social Welfare and Development’s (DSWD) National Household Targeting System. RED Gerundio stressed that the fund assistance given to the farm households, is not a dole-out and shall be paid back. The schedule of repayment is based on the projected income statement of the project. It is expected that the farm-household will be able to return the assistance fund starting from the 2nd to the 3rd year after the project has started. The DA Director said that AKBay funds short-gestating, micro-scale and resource-based livelihood projects in or related to agriculture and fisheries such as crop production, animal raising, aquaculture, capture fishing involving acquisition of fishing paraphernalia, acquisition of small farm implements, small scale processing and handicraft making. Thus said Karapatan spokesperson Cristina Palabay today as she and Atty. Edre Olalia of the National Union of People’s Lawyers joined human rights defenders from Colombia, Palestine, Belarus, Belgium, Chechnya, the Netherlands, Belgium and the United Kingdom in a conference of human rights defenders organized by the Haldane Society of Socialist Lawyers, Amnesty International, and the European Association of Lawyers for Democracy and World Human Rights in London. The delegates also met with United Kingdom parliamentarians led by MP Jeremy Corbyn to brief them of the current human rights situation in the country. Corbyn also gave the opening remarks during the said conference. In a paper presented by Karapatan and NUPL and in the workshops, Karapatan raised the recent killing of Fr. Fausto “Pops” Tentorio as among the most recent attacks against human rights defenders, while police investigation is yet to pinpoint the mastermind of the killing even if authorities claimed that they have arrested a suspect last December. “Fr. Pops is among the 37 human rights defenders who are victims of extrajudicial killings (EJKs) under the Aquino administration, with the total number of victims documented at 67 in the one and a half years of his presidency. There is approximately one EJK per week. Three out of nine victims of enforced disappearances are human rights defenders. Most of them are farmers, indigenous peoples, workers and the urban poor who are defending their right to land, ancestral domain, livelihood, decent housing, jobs and other basic and fundamental rights,” they said. Palabay said further attacks against human rights defenders are looming with the counter-insurgency program Oplan Bayanihan, no different from Arroyo’s Oplan Bantay Laya, enforced. She cited the threat against 72 leaders of people’s organizations and institutions, including leaders of Karapatan in Southern Tagalog, to be again charged with baseless and trumped up cases of multiple murder, despite a court dismissal of the same charges. “The case of the Southern Tagalog 72 and the threat that warrants of arrests may be issued against them despite the dismissal of the same charges previously is illustrative of the situation of HRDs in the Philippines – threatened, vilified, heaped upon with fabricated charges, imprisoned, silenced,” Palabay added. Palabay will also head the delegation of the Philippine UPR Watch, a network of organizations and church institutions engaging in the Universal Periodic Review process, in Geneva, Switzerland this coming February 27 to March 13, 2012. TACLOBAN CITY – The Regional Development Council (RDC-8) formally approved the endorsement during its latest Execom Meeting the newly drafted Samar Island Tourism Master Development Plan to guide stakeholders in making the island an alternative tourist destination by 2016. Department of Trade and Industry (DTI-8) Regional Director Cynthia Nierras, who presented the newly formulated plan in place of DOT-8 Dir. Karina Rosa Tiopes during the Execom Meeting, said the plan provides a framework and direction for tourism development is the three provinces of Samar Island. Dir. Nierras also presented to the body that the plan, which was drafted by the Samar tourism stakeholders and consultancy firm Berkman International, also lists major infrastructure projects to support tourism promotion. These include completion of a circumferential road, upgrading of the national highway, opening of access roads to tourist spots, construction of diversion roads, and airport upgrading. According to Dir. Nierras, among the areas considered in the master development plan include the identification of strategic tourism development areas, marketing component, physical infrastructure development, social analysis, gender considerations. Site validation was conducted in identified attractions to find out what types of development that is appropriate for each attraction. The aspirations of the local people in Samar Island were also documented and were considered as basis for introducing tourism development. Samar Island, which is home to eco-tourism adventure, cultural and heritage sites, and rich marine life, is identified as an emerging tourism destination. Earlier, tourism stakeholders in three Samar provinces identified 18 destinations that will be prioritized in the master plan, aiming to make the country’s third largest island as tourist haven by 2016. 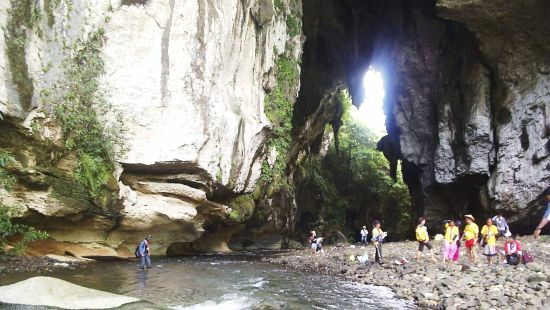 Samar Island also has the largest cave and most amazing adventure tourists since last year, according to the Samar Island Natural Park. Among the known destinations in the island are the Sohoton Natural Bridge National Park in Basey, Calbiga Caves in Calbiga, the network of waterfalls in Calbayog City, all in Samar; the Biri Protected Seascapes in Biri; the San Antonio Beaches in San Antonio, both in Northern Samar; the Borongan-Llorente forest canopy in Borongan Samar; and surfing on Calicoan Island, Guiuan, both in Eastern Samar. The tourism department is hoping that local government officials will not just set aside the plan for tourism, an industry eyed by stakeholders that would address poverty in Samar once developed. TACLOBAN CITY – As a continuing fulfillment of its commitment to help in the national government’s thrust to provide adequate school buildings to endow students with a conducive learning atmosphere for the Filipino youth, the Federation of Filipino-Chinese Chamber of Commerce and Industry, Inc., another set of school buildings in farflung barangays in Leyte. Elementary schools in Brgy. Canap in San Miguel, Brgy. Santol in Alangalan, Brgy Sogod in Carigara, and another in Babatngon, all of Leyte province were recipients of new classroom buildings constructed by FCCCII. FFCCCII Vice-Chairman Antonio Cosing, who led the turn over ceremony said the school building project is under “Operation Barrio Schools” a project of the Federation of Filipino-Chinese Chambers of Commerce and Industry Incorporated and the Tacloban Filipino-Chinese Chamber of Commerce and Industry. For the past five decades, the Federation has always been an advocate for corporate social responsibility. One of its major programs is the Operation: Barrio Schools, which involves the donation of classroom buildings in areas where classrooms are needed. As the Federation's flagship project, Operation: Barrio Schools is the longest running and biggest private-sector-led development program focused on educational infrastructure. Leyte Governor Carlos Jericho Petilla lauded the Filipino-Chinese community for bringing this program to the barangays which are really in need of more classrooms. “These new classrooms will really help our local schools especially with the start of the implementation of the K+12 program next school year,” Gov. Petilla said during the simple turn-over ceremonies. The governor said, as the national government tries to fight poverty through education and raise the quality of learning through the K+12, one big problem which the education department will encounter is the need for more classrooms. “We are thankful that we have private groups who are prepared to give assistance to our schools,” Gov. Petilla added. Under the Operation: Barrio Schools, the Federation raises funds to finance the construction of standard school buildings out of donations from the officers and members of the federation and from benevolent organizations, families and individuals within the Chinese-Filipino community.